I would translate this as "connecting bridge." 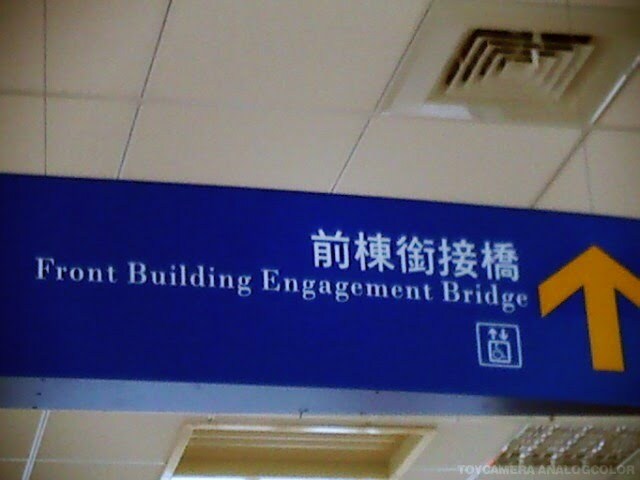 So how did the makers of this sign came up with "engagement bridge"? xiánjiē 銜接 usually means "connect; converge; link (up); join" and in some cases "hook (up)" or "articulate". But xiánjiē 銜接 also has the specialized medical meaning of "engage(ment)", as in "the phase of parturition in which the fetal head passes into the cavity of the true pelvis" (from the American Heritage Dictionary). Online Chinese dictionaries render this sense as 【医】衔接, i.e.,【Med.】xiánjiē 銜接. Perhaps the software chose this sense because of the ordering precedence of "【" (before the beginning of the alphabet). In any event, it was unfortunate that the person(s) responsible for making this sign chose the most specialized and least appropriate of all senses of xiánjiē 銜接, resulting in "Engagement Bridge", which will surely be baffling for speakers of English (for whom the sign is intended, after all). They will probably think it signifies a bridge where people go to propose marriage! For xiánjiē 衔接, nCiku.com gives "link up; join; connect". That's pretty straightforward and wouldn't have caused a problem. Most online dictionaries do not have an entry for xiánjiē qiáo 衔接桥; it seems that "engagement bridge" isn't a standard mistranslation. One of the few online occurrences of "engagement bridge" for xiánjiē qiáo 銜接橋 I could find was in a blog about Taiwan (see below in the acknowledgements), and it is talking about the same sign that I am discussing here. Google Translate renders xiánjiē qiáo 銜接橋 as "convergence bridge", which would be just as puzzling for English speakers as "engagement bridge". Curiously, there's a "Go Between Bridge" in Brisbane. This is suitably translated into Chinese as jiēlián qiáo 接連橋, which is another (more common than xiánjiē qiáo 銜接橋) term for "connecting bridge". "Go Between Bridge" is unidiomatic in American English, unless it were referring to a place where matchmakers ply their trade. Speakers of Australian English can tell us whether it is idiomatic for them when they want to refer to what we call a "connecting bridge". Incidentally, architects refer to such structures as "building to building pedestrian bridges". More colloquially, such a bridge may be styled a "skyway," "catwalk," "sky bridge," or "skywalk".